In early January, I arrived in Managua, Nicaragua, to help the Zamora Terán Foundation with their One Laptop per Child implementation to improve public school education for Nicaraguan children. My roles have been providing training and direction on the technical and logistics fronts, sharing experiences from other countries, and helping out on the day-to-day tasks which inevitably draw attention. The foundation was set up last year as part of the corporate social responsibility programme of the LAFISE/Bancentro banking group. 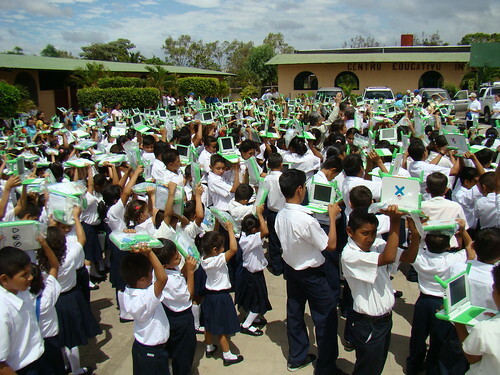 This means that it’s an OLPC project backed by the private sector. 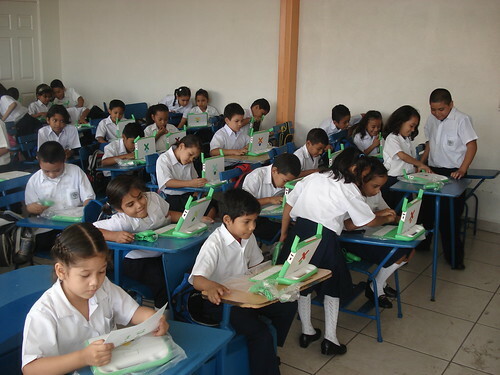 The usual OLPC principles are followed: entire schools are saturated at a time, all children aged 6-12 receive a laptop. They take it home and share with their family. Teacher training is provided before the laptops arrive and is supplemented on a regular basis. Internet access is provided at the schools, even in the places where you really wouldn’t think connectivity is possible. The project has currently reached 7 schools, ranging from single-room multigrade schools to schools with 600 children in primary education. From isolated 19-family communities to big cities. Quite a mix! The schools are spread all over the Pacific coast of Nicaragua, which adds various interesting challenges to the project; while it’s not difficult to travel between schools, you are talking about a fair amount of A-to-B. Fortunately, the foundation has the resources of the bank at its disposal (in addition to their drivers and vehicles, we can use their courier system, quite useful in a country that doesn’t really have a postal service!). The project also benefits from a partnerships with other organisations, a collection of dedicated volunteers, and a collaboration with the Ministry of Education. About 2000 children are covered by the programme so far, a number that will grow through the year. An exciting recent development is a significant donation from the Embassy of Denmark; with their support, the foundation will soon be initiating a 6000-laptop deployment in 2 cities on the Caribbean coast. One interesting model that I’ve not seen in other OLPC deployments is the way that the foundation runs a “give a school” model. The foundation has a significant stock of laptops in the country and other organisations can make a donation to cause the project to land in a specific school; the donor covers the cost of the equipment and infrastructure, and the foundation does the rest (logistics, connectivity, laptop handout, teacher training, followup and repairs, etc.). Nicaragua is a fascinating country; in addition to the obligatory weekend excursions to volcanoes, lagunas and beaches, I’ve had the opportunity to glimpse “the real Nicaragua” while travelling with the project. it has been refreshing to see that even in the areas where living conditions are strikingly harsh, you can see that the local people are really focusing on community and education: the schools and the churches are the best-constructed buildings in town.